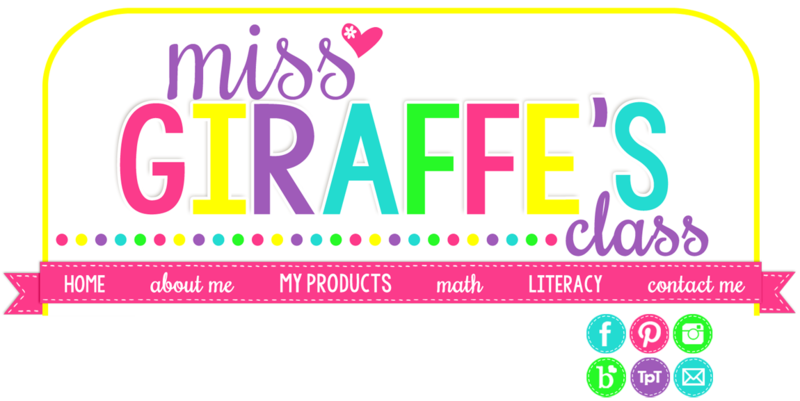 Miss Giraffe's Class: New to Teaching First Grade? Everything You Need to Know! New to Teaching First Grade? Everything You Need to Know! Are you brand new to teaching first grade? I have SO many first grade teaching tips for you that break down absolutely everything you need to know to get started on this new adventure! First of all - get excited! First grade is one of the best grades ever. 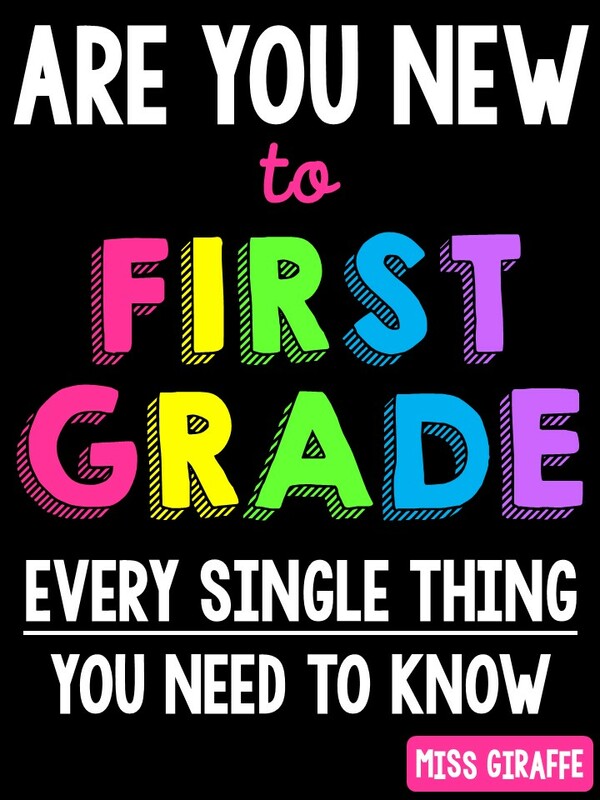 Whether you are a brand new first year teacher, transitioning from another grade level, or simply coming back to the classroom after taking a break, I think you are going to love 1st grade! It is such a fun grade and you are laying the foundations for so many math skills and you get to teach kids HOW TO READ. It is the best feeling ever when it clicks for each one – some take longer than others but it is a magical feeling every, single, time. They will go from sounding out cat to reading real books by themselves (some even chapter books! )… they will go from counting to 100 to adding and subtracting 2 digit numbers. It is a huge year of growth that is amazing to watch and be a part of! Okay, let’s get right into it! Teaching math is probably going to be your most time consuming ongoing project, or at least it can feel that way. You introduce SO many concepts in first grade and a lot of times it is the first time they are ever seeing anything like it so math instruction has a lot of different components. Not to worry, though! Once you get into a groove and have the materials you need, it’s actually a lot of fun. In fact, I think it’s the most fun subject because there are so many awesome math center games and small group activities that make learning each concept so much fun! Math is actually by far my favorite subject now (and I didn’t love math as a kid)! First grade math consists of whole group lessons, small group lessons, center activities, practice worksheets, and assessment. All of these should be fun, hands on, and differentiated as much as possible. Sound scary? It’s not! I will break each one of these down for you, don’t worry! Whole group math instruction is where you introduce a new concept. Unless your school requires a certain amount of whole group every day (yuck, hopefully not), this is not something you have to do every day.. at all. Only when you’re introducing a new concept. Although, in first grade, sometimes you actually are introducing a new concept (or expanding on one) every day so it’s okay if you do a whole group lesson every day. Just try to keep them short. 10-15 minutes typically. Sometimes it might even be 5 minutes if it’s just adding to something they already know. The real teaching and learning happens in your leveled small groups. I personally think whole group is wonderful for simply introducing a new concept to everyone in a quick, short lesson. It’s a quick intro to the concept and allows you to informally assess where they all are to target their needs in small groups. Always bring them to the carpet for whole group math lessons. Start your lesson on the new topic. Do some examples together with visuals they can see (writing on the board or an easel is perfect). Then it’s time to practice together! While practicing the new concept together, always have some way to assess their understanding to see where they are that assesses everyone at the same time. If you only call on a few kids for answers, you only assessed those kids. Assessing can be as simple as having them put the answer on their fingers and hiding it in their laps until you say, “Show me” to have them all show you at the same time or having them think for a few moments then tell them to tell their carpet partner their answer and listen in (and then ask for volunteers to answer). Don’t feel frustrated if they look at you blankly. You’re just introducing the concept. It’s okay if they didn’t all “get it” right away during whole group - you’re going to give them a lot of attention and help in small groups to learn it. I think practice worksheets are essential for first grade math instruction. It is basically an assessment every time to see if they understood the concept as well as practice to help them solidify the concept. They’re learning SO many different concepts that it’s so important to make sure you don’t miss anything that they didn’t get. Hands on activities are wonderful but writing with a pencil and paper really helps hammer that concept in there and lets you clearly see whether or not they got it. If they didn’t get it, you can easily fill in that gap in small groups which I’ll talk about it in a second. I differentiate my worksheets into 3 levels - A, B, C - found in a star in the top right corner of every worksheet. Personally, I recommend giving everyone the worksheet at their level to practice the skill as soon as your whole group lesson is over (or as soon as math starts if you’re not doing a whole group lesson that day). This is how you can differentiate on the spot if you want to. For the kids who seemed to struggle in the lesson, give them the A worksheet. For the majority of the class, you will give the B worksheet, and your kids you know got it right away or who typically fly through their math work with accuracy, the C worksheet. Let me explain a little bit how I differentiate using worksheets. You'll teach a whole group lesson at the carpet showing on the board or your easel how to take 3 numbers and put them in order. You'll do a few examples on the board yourself, talking through your thinking of how you're doing it. First, start with three 1 digit numbers and do 2 examples. As you do each example, say out loud exactly what you are doing for each step. Then, write three 1 digit numbers on the board for them to do. This is a great time to use personal white boards. Have them write down their answer then hold their board against their chest (teach them how to hold it up against themselves but without it technically touching them so it doesn't rub off the marker). Then have them all show you at the same time. Super quick easy way to assess! Then, do the same thing with 2 digit numbers and show how to put them in order. You could show them how to look at the tens place. You could point to numbers on a hundreds chart poster if you have one to show how it came before. You could also hold up a number line to show how one number comes before another. Whatever strategies you want to teach them in whole group but remember, this lesson is only about 15 minutes. Then, students will return to their seats and you'll give the majority of your class the B level (look in the star in the top right corner for level) to practice. Do NOT say anything about levels or tell students to grab a certain sheet. Put the copies of each level between your fingers. The easiest way I've found to do it is put Level A between your ring and middle finger, C between your middle and pointer finger, and B between your pointer and thumb and walk around to quickly hand them out. The majority you'll be giving from B so it's nice to have that on top then when you get to a student who needs A or C level, you can grab that for them without students really noticing. You never want them to know their levels or feel inferior/superior. If they ask why they're different, you can say so that they don't copy or just that the worksheets are different sometimes ;) They can work as soon as they get their paper. This Level B worksheet is directly practicing the skill you learned on the carpet. Them completing this worksheet independently at their seats will tell you exactly how well they understand it. My math worksheets also always have a self-assessment at the bottom. I talk a little about this in my Teacher Tricks for Math post (scroll almost all the way to the bottom) but essentially, you teach them how to assess their own understanding. If they did it super quick and it was really easy for them and they didn't need any help or have to think much, they would circle easy. If it was "Just Right," they had to think a little and worked at a normal pace and maybe had a question or two or none but it felt like a regular assignment. If they felt like they needed help or got several wrong, they'd circle "Hard." You may think they won't be honest (which they might not be at first) but you can really train them to be! It's SO nice when they can assess their own understanding and be responsible enough to ask for help when they need it or ask for more challenging work when they need it. Anyway! So this worksheet goes from ordering 3 numbers to ordering 5 numbers which is a jump in skill level BUT is still a B level worksheet because there aren't that many to do so it's not overwhelming and is still on grade level. Since it is a little more difficult, they will want to use strategies that you showed in whole group like underlining the tens place... and definitely the strategy of crossing out numbers once they've been used (which the example above shows). Notice how this practices 5 numbers instead of 3 so it already requires more thinking and strategy. It also has a lot more problems for more practice, as well as more problems that include numbers in the 80s and 90s to give a bigger range of numbers. This makes it more appropriate for your high students. As I say in my How to Keep Gifted Kids Engaged and Learning post, it's not just about more work. You want to give them more challenging work. Yes, that sometimes means more problems but it's often more about extending the skills or challenging them to think more or combining skills. This C level worksheet extends the lesson by adding the related concept of >, <, = symbols and practicing the current concept. For these kids who "get it" right away, simply tell them to make a chomping fish with their hands and tell them the chomping fish wants to eat the biggest number and they'll be able to complete this themselves. Adding in a little extra thing like this really helps them feel connected to the lesson (since they're still practicing the concept on the right) but also like they're being pushed because they're getting to try something brand new. SO important for keeping your high kids engaged. Ordering numbers to 10 will be WAY easier for them and will help build their confidence with this skill. When a struggling kid can circle "Easy," it can be tear jerking. Yes, I well up about teaching math sometimes, don't judge me :) Anyway, you can tell them to count to 10 to help order the numbers (as they count, if they see a number there, write it down until they get to 10 and by the time they get to 10, they should've used all their numbers) OR they can use the number line they have at their desk. I love every student having their own number line they can use when they want to - you can get name tags that have them or buy individual number line strips. If they didn't circle "Easy," then you know to work with them a lot more in small groups on this concept using 1 digit numbers for awhile. Then eventually working up to 2 digit numbers once they've really mastered 1 digit numbers. This is a great Level A worksheet because it practices the grade level standard of ordering numbers but at their level. There are only 3 numbers to order and the numbers tend to stay around 50 or under so they're not working with huge numbers. It's also less problems than the Level B worksheet so they don't get overwhelmed. One thing you can also do with your struggling students is, as soon as you finish your whole group lesson and pass out all the papers, call them to come to your teaching table with their worksheets to be the first group you see. In this style, as soon as students get their worksheet, as soon as someone is done with their worksheet, that student can start centers. OR you can walk around and help while the entire class does the worksheet (more traditional method) and you wait for everyone to finish their worksheet to start small groups and centers. If you do this, make sure there is something educationally productive math-wise they can do when they finish their worksheet (NOT hop on a computer or tablet or something that will make them rush through the work). You do have to wait for everyone to finish but this is the more traditional way of giving work – it’s really up to you and your style. I prefer the method of letting students go straight to centers as soon as they're done because, as a kid, I always finished my work really quickly and hated waiting for the rest of the class to finish but that's my own personal bias. Do whatever works best for you and your students. As they turn in their worksheets, quickly glance at them to see if they're majority correct or not. Since it's easy first grade material, you can literally scan each worksheet in seconds. That's one of the wonderful things about teaching first grade and grading.. you can do it by eye really quickly! A trick to doing it even quicker is to take 2 of the same worksheet side by side and look at each problem back and forth to make sure they're the same. You can also pick a student's paper who you know usually gets everything right (or scan one to make sure it's all right) then use that as your key to grade the rest :) Teacher tricks, I tell ya! Put all the ones that were correct (or only missed 1 that looked like an easy mistake type thing) in 1 pile. If any had several wrong or the student circled "Hard," put those in another pile to address during small groups or whenever you can call on that student to reteach and help them. It's such a quick, easy way to assess every single day and make sure no one misses out on a single skill! As you can see, you can differentiate A TON and tailor every lesson to exactly fit the needs of each individual student with the same worksheet, same lesson, same moment... it's amazing! I made differentiated worksheets like this for EVERY single first grade math skill. They're inside each of my first grade math units for each concept. Score!! This is where so much of the learning happens! After your whole group lesson, students should either be given classwork at their level for that concept or do math centers while you call small groups. You may also have a lower middle group... or 2 below level groups.. or 2 advanced groups. It all varies class to class! Especially in the beginning of the year, these groups can change a lot! Don't feel like you stuck a kid in the Orange group so he's always there. Move them around as much as you want. Make sure you structure your centers so you can call kids to your teaching table at any time. If someone seems way higher than their current group, call them in the next highest group instead. If someone is struggling to keep up with their group, call them in the group a level below instead. Actually, I recommend groups staying mostly the same but changing based on each individual concept. If a student who is normally in your middle group really struggled with your Fractions whole group lesson or the worksheet, call them in the below level group that day. It really allows you to target each skill for each kid when your groups are flexible. Sometimes a typically really high performing kid can intensely struggle with a certain concept (I was labeled a "gifted" kid and always breezed through my work but I struggled with telling time and fractions) or a student who usually struggles with math can be amazing at geometry, etc. so keep your groups flexible! Weird side note: If you label groups, give them a color assignment like the purple group, orange group, etc. Try to avoid red, yellow, green as kids learn pretty much in kindergarten or preschool that red is bad, yellow is warning, green is good and might deduct from there. Sorry if I ramble about this sort of thing, I just care a lot about students and their feelings - you always want every kid to feel smart and confident so you have to be really careful to not disclose levels or focus on that sort of thing out loud. Personally, I say call students back to your table by their name each time (instead of a group name) because, especially in the beginning of the year, your groups are going to change SO much! Some kids may come in seeming so low but it’s actually just a matter of exposure and they start soaring once they’re introduced to concepts. Other kids may have a lot of knowledge it seems but struggle with new things. Kids will bounce around groups a lot. Calling them by name is actually easier because you can make the group whatever you want AND they come to their name a lot faster than “Blue Group,” especially in the beginning of the year when they don’t even remember “Blue Group” means them. An easy way to group your kids in the beginning of the year is to write your students' names in a vertical list on a piece of paper in order of how proficient they seem in math then simply draw a line under every 4-6 kids to form groups. Depending on how many students you have, you’ll have 4-6 groups. When you group your kids into leveled groups of 4-6 kids each to start the year, try to base it on whatever data you might have from the previous year, assessments you’ve given, or just whatever it seems like your best guess is if you don't have data. You can change these groups as much as you want - even daily if you want, like I said - so don't stress about it. So break your kids up into groups of about 5 kids (4-6 per group) that you’ll call while everyone else either works on classwork – either practice worksheets, centers, or both. THIS small groups time is where you do the real teaching! Whatever the concept is that you introduced that day or a previous day, teach it to the level of that group. Your low group may need way easier problems, use a lot of hands on visuals to create the problems, a lot of extra practice, etc. Try to practice the concept in fun, hands on ways. I highly recommend using the centers and small groups activities in my math units. Many of them are differentiated already so you can do them with all of your groups but simply adjust the activity to their level. Then, these become the practice centers they do independently or with partners/groups the next week to review the concept in centers. Your high group, you may be able to use way bigger numbers or more complex questions, go through way more.. etc. that wouldn't be able to do with the rest of the class so doing small groups with them lets you push them without overwhelming the other kids. Your low group, you will be able to go slow and break things down for them without boring the other kids. That's why I love small groups - kids can learn exactly at their level with very individualized attention. Since your small groups lessons are at each kids’ level plus you’re sitting so close to them as they learn/work, you can also immediately see exactly which kids get it and who is struggling and provide support right then and there. - Extending the whole group lesson (for your on grade level and advanced kids) to add new strategies for doing it, doing harder problems, adding related concepts, etc. Small groups can be whatever you want it to be that you think best teaches and expands the concept for each group! Don't feel like you have to do these huge planned out lessons - it's really just about supporting the kids at their level with whatever you're learning in math that week. If you did a whole other sheet with hands on practice like a cut and paste worksheet, that's an easy way to practice. You could even give them all a different sheet to work on in front of you at your small groups table so they can't copy each other (so you see exactly who gets it and who needs help) but are all doing the same activity and you can help anyone who's struggling right then and there. For cut and paste worksheets you want to use for small groups, you can laminate them then cut out the pieces so you can reuse them for each group instead of having kids cut and paste them. These are actually a GREAT example of a cut and paste worksheet you can make really fun and colorful AND turn it into a reusable hands on center. If you go to my Fact Fluency in First Grade post and scroll to the bright red worksheet titled "Fact Fluency," I explain how I turn cut and pastes into colorful centers you can reuse. It's an awesome way to take any cut and paste worksheet and make it into a fun and hands on center you can make once then use over and over. It's a great way to save copy paper and time copying too! I shared easy to follow directions in that Fact Fluency post. Then you could do these as a small groups game and also make them a center later.. kids could do them then swap and do the next one, etc. Every single first grade math concept in my math units comes with at least one fun math center for the kids to do that directly practices what you're teaching, what they've done in their worksheets, and what's going to be on the assessment later. It's so important for all of these things to be consistent! You want your centers to match what you taught in your whole group lesson and what their practice worksheets are practicing. If you look at the picture above, you'll notice my centers come with a student friendly directions page and a teacher directions page. The student friendly directions pages are great because you can set them out with the center to make them independent. The teacher directions are my note to you to explain to you how the center is played, any tips for prepping it, and also directions/tips for differentiation if the center can be differentiated. Then you see it has the materials and a recording sheet. It is SO important to have a recording sheet in first grade for accountability! Without a recording sheet, you have no idea if they got it right or if they even did the center because you're busy teaching small groups.. so a recording sheet is imperative. For this center, students are given cards with sets of 4 numbers on them. They look at each set of numbers and sort them as to whether they are "In Order" or "Uh Oh! Out of Order!" This center can be done on their table OR in a pocket chart. It fits really nice in my pocket chart! Once they have sorted the sets of numbers, they fill out their recording sheet. For numbers that were already in order, they simply copy them into the "In Order" side. For numbers that were OUT of order... they have to look at the card and put them in order on their recording sheet in the "All Fixed Up!" column. It's a great practice center and, as you can see, directly practices the skill they've been working on. In the first picture, you may have noticed a paper with additional cards that said "For challenge level" in the stack of materials. That's because I always try to differentiate my math centers when I can. For your students you want to challenge, I made extra cards for them that are not only more cards but a little bit harder (bigger numbers). You may also notice in the picture below the recording sheet at the bottom right of this page is to be used if you add the challenge cards. It has more lines for students to complete. Another thing I like to do is have centers that can be used over and over so they stay in the buckets for weeks or can be brought back throughout the year for review. This center you could do twice if you took the challenge cards and mixed them in to create 2 rounds of it using the on grade level (not challenge) worksheet. I also have another Ordering Numbers center in that unit called Roll and Order that can be played over and over. I also have the Grab and Order center in that same concept (11.1 Ordering Numbers) in Unit 11 that can be played over and over with the number cards from that unit. I already put a lot of pictures so far so I don't want to overwhelm you but just wanted to make the point that it's great when centers are infinite as well. I try to make a lot of my centers be that way, which is usually easy, especially if they involve dice! Kids LOVE dice games. For each concept, you’re assessing by the practice worksheets they complete. If they struggled with the B, reteach them in small groups and have them try another B worksheet OR give them an A worksheet to build up to B, etc. However, you also want to formally assess from time to time. Since it's first grade, I recommend only doing a formal "test" after each unit (so about every 2 weeks). It's not a stressful thing - just a quick test that has a few problems for each concept to make sure they retained the knowledge. If you notice, there are 2 problems that practice Ordering numbers in the left middle of the page. That is because the unit also covers greater than/less than/equal to and skip counting so the unit test assesses all of those. I think it's important to have at least 2 problems per concept so if they miss one, it could've simply been an error or them working quickly but if they miss both, you know you definitely need to reteach that to them. All of my math units have 3 versions of the test so you can reteach the concept if necessary then retest with new numbers. You can also use it to do a test before you teach the concepts to assess where they were before the lesson and then again after to see how much they've grown. You could also simply give out all 3 to have kids have different tests to avoid copying (although if it's a test and you're walking around, there probably won't be much of that). I definitely recommend saving the 3rd copy to put together with the other units' tests from a quarter to do a bigger quarterly test each quarter for report cards.. or trimester.. however your school breaks apart their report card periods. It's great data for you to see how well they've mastered the first grade concepts. What meant so much to me while I was making the tests for my units is that they test exactly what you taught and what the students practice. It irks me so much when assessments are purposefully tricky or ask questions they haven't practiced how to do. Who wants to frustrate a 6 year old like that after they've worked so hard to learn how to do something? Definitely not me! :) So I designed my tests to directly assess what they've practiced and learned and what they're used to seeing on their worksheets and in their centers. - Math: But where do I get all this stuff?! The reason why I say math feels like your most time consuming project is because you are constantly searching for new centers to do for each concept, trying to make it fun and hands on, and differentiating. You can spend hours & hours each week doing it yourself – that is doable. If you want someone to do ALL of that searching for materials for you, all of that differentiating for you…. I have literally done that for first grade math. 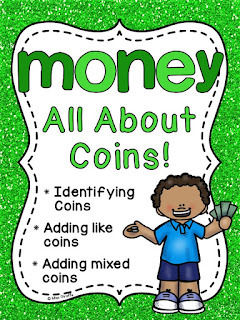 My math units cover the first grade math concepts and, for every concept, have practice worksheets differentiated into at least 3 levels, hands on centers to practice each concept with student friendly directions and teacher directions, cut and paste sheets to practice in fun ways, and lots of activity ideas. I only showed you SOME of the things from ONE concept out of ONE unit. There are 18 units full of first grade math concepts. As I just mentioned, too, there are also 3 assessments at the end of each unit to test all the concepts in the unit that directly correlate to all the practice work they did and center games they played. I made all of these so first grade teachers could have absolutely everything they need all in one place and consistent style so all they have to do each week is open up my units and pull out what they need instead of constantly searching for new centers and worksheets each week. Like I said, you can do it yourself. It is possible :) It is just a TON of work and time spent every week trying to find or make centers that actually match your worksheets. If you want it all already done for you, I've got you covered. They’re in 2 bundles because TpT used to have a 100 MB file size limit and I wanted to stuff way more than that into them :) They’re the same price they’d be if I bundled them together. They are already super heavily discounted – it’s simply 2 downloads because they were too big to fit before they raised the limit. I LOVE my math units – I put so much time and love into them that I hope you love them if you do get them. You can also get each unit separately if you’d rather try them out first. You can see what concepts are covered in each unit by looking at each unit's cover. Even if you don’t get the math units, those posts still have A LOT of fun ideas you can use to teach those concepts which are first grade concepts so you will be teaching them most likely. I highly recommend checking them out for fun math ideas! I constantly get the question: What order should I teach first grade concepts in? Typically, you’ll have a curriculum to follow that tells you the order it wants. I purposely designed my math units to not require you to do any unit before doing another so you can use one unit by itself at any time, as well as do them in any order you choose to supplement any curriculum. You can also use them as your sole curriculum if you don’t have one. In that case, I recommend going in the order I put them in. If you go to my MATH PAGE, you can see the covers to all of the math units which list the concepts within each unit. 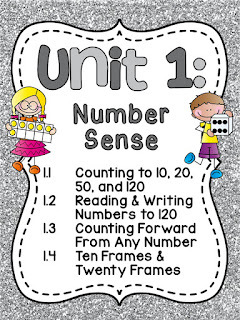 You honestly can do them in any order you choose but I highly recommend starting with Unit 1 and then Unit 2 first to make sure you solidify their number sense before moving on. I also recommend using the pieces from Unit 1 throughout the beginning of the year while you're doing the first few units to keep number knowledge fresh and practiced. You can play the Boxed Out game I show in my Building Number Sense post, for example, as a center for weeks because it is different every time they play it but gives a lot of practice. 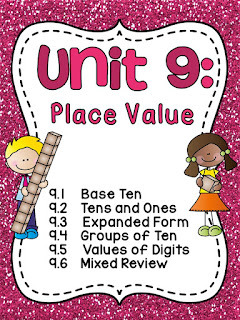 After Units 1 and 2, I recommend either the place value unit (Unit 9) or going next in my order (Unit 3) to start basic addition :) Like I said, I prefer the order I put them in, especially Units 1-8. After that, the concepts become a little more unique and less needing of the earlier units for foundation like Geometry or Telling Time or Fractions where you can put them wherever you want and you're more likely to teach those concepts during the 2nd half of the year. Some people do graphing and/or geometry early in the year too… like I said, it’s up to you! I designed them all to stand by themselves so you can do it however you like! As far as pacing, I recommend spending about 2 weeks per math unit to fit it all into 1 school year, spending more time on unit concepts they struggle with and less time on ones they master right away. It really depends on your class and your students. That’s why the self-assessments at the bottom of the worksheets and unit tests are so important – so you know if you need to spend more time teaching something or if they are good to move on. Spend a day or two on each concept (1.1 is a concept, 1.2 is a concept, etc.) depending on how quickly your students get it. Some units may take you longer if students need more time and practice. Others they may zip through! Whatever your school happens to call it, this is when you finally get to meet your new students! It’s exciting and scary all at the same time – just like the entirety of starting this new adventure, right? Make sure your students’ names are in the room somewhere. It is SO nice for them to walk around and see their name on things and feel a sense of belonging and ownership in their new classroom. Plus, going around looking for their name is something they can do to occupy themselves to calm their nerves (and their parents’ nerves! haha) and/or keep busy if you’re talking to another parent/child and they're waiting for their turn. You get to teach kids how to read! A skill they will use every day their entire lives… and YOU get to be that person! How amazing is that?! It is truly an honor. I believe first grade reading is all about phonics and teaching each new sound in a consistent, fun way. That’s why I’m obsessed with my no prep packs because the worksheets and activities stay the same each week but only the new sound changes. There are a lot of great resources out there but whatever you end up getting, whether it is from me or from someone else, look for that quality! This is so important because kids can focus on learning the new sound, NOT have to spend time and brain energy figuring out how to do it. Plus you don’t have to give directions after they’ve done it for a few weeks (for the whole year!!) which is magical.. absolutely magical, I tell you. I’m going to go over all 4 in this section! Each week, you’re going to introduce a new phonics sound or sounds. Your curriculum should give you an order. If it doesn’t, a basic sample order is a week for each short vowel (CVC), a week for each CVCe long vowel (a_e, i_e, o_e, u_e... skip e_e as there are hardly any e_e words and most aren't ones first graders encounter that aren't sight words), a week for each digraph, a week for each easy vowel pair (usually in sets like ai/ay, ee/ea, etc. ), a week for each of the 3 bossy R sounds (ar, or, and er/ir/ur), a week each for harder combos of vowel pairs (such as EW UE UI), then soft c & soft g, etc. A lot of teachers also teach blends separately and other sounds like double consonants, sounds of ED, etc. Hopefully your curriculum gave you an order but, if not, that's a basic guide to follow. To make your own order, figure out how many teaching weeks you have and plug in the sounds. Short a, short o, short i, short e, short u, long a a_e, long i i_e.... and so on until you've filled all your weeks. They show activities for the specific sound I'm talking about but you can use those ideas for every phonics sound for the whole year. Any time I make a phonics resource, I try to make it for every phonics sound so you can use the same activities all year :) So if you see something you love for the TH digraph, I probably also have it for any other sound you want to teach. Those posts show pages from my Phonics No Prep Packs, activities from different centers I have, etc. I want to quickly show you some phonics examples so you can get an idea of what first grade phonics work looks like. These examples are going to be from my Long A No Prep Pack but, as I said, they are consistent so the activities are the same in each pack for each sound. Since it is first grade and they are learning how to read words, you want to use A LOT of pictures. Your activities in the beginning of the week will be a lot of looking at pictures and matching the word or writing the word. Here is an example where they read the word then match the picture. My no prep packs have a lot of activities where they are working only with words in isolation like this. Then there are activities where they move to matching pictures to sentences with the words in context. Then there are activities with words only. Then activities with the words in sentences without pictures, etc. You build them up as the week progresses until you get them reading sentences with the words fluently. For example, this activity has them read sentences with the words in context and sort them by word family. Compare the 2 pictures. See how they're practicing the same skill but the 2nd one is more difficult? It's subtle but it is. The sentences are a tad harder. One of them is a question. There are several words with beginning blends which can be difficult (skate, Blake, snake). In the 1st one, there was both an -ate word and an -ake word in each sentence which made them easy to locate. In the 2nd, they are found all over. One sentence has 2 -ate words, one sentence has 2 -ake words AND an -ate word, one sentence has 2 -ake words, and one sentence only has one -ate.. see how it's actually a lot harder? The worksheets and activities in my phonics prep packs are differentiated like this so you can pull the same activities but at each child's level. They think it's funny to read the "wrong" words and it's great reading practice to read it both ways before circling the correct one! There are a ton of other worksheets in that pack but I just wanted to show you a few quick examples to explain what first grade phonics is like. I hope that was helpful! Again, there are a lot of great things out there and you can gather yourself but I am giving you the links to my resources so that you know they're an option if you want me to do the work for you. A huge part of learning to read is reading fluently. It's hard to understand what you're reading if you're struggling to sound out the words so fluency is key! Learning all the phonics sounds is the key to this! That's why I always try to go from words to sentences with those words in my phonics packs so you can build them up to reading sentences fluently. For each phonics sound, they do a puzzle activity that combines learning the phonics sound with fluency practice AND comprehension practice. They read the passage, highlight words with the phonics sound being practiced (here it's long a CVCe words like the examples I've been showing) then they have to put the pictures of events in the story in order then glue them to the main puzzle piece to show their comprehension. Then they write the words from the story with that phonics sound. It practices SO much in one little puzzle activity kids love. These come in a mixed up black and white version so you can do them like this AND full color versions so you can cut them up to use as puzzles for a super colorful fun reading center. It has examples for them for the other phonics sounds too, as well as fun notebook tips you can use for any notebook activities you do. Wait? You teach them how to read words and know what they’re saying?! It seriously seems crazy to imagine the kids coming to you struggling to sound out the word "hat" will be reading paragraphs soon and knowing what they just said but it is so possible! So far I've been showing you Long A CVCe activities... well, how do you practice comprehension when a child is still learning how to read? You use phonics based reading passages so all of the words they encounter are ones they are currently practicing. So they're practicing phonics, fluency, and comprehension all at the same time! It's so helpful when you can connect all their learning. Earlier I showed you activities where students circled and sorted -ake words and -ate words. Extend that learning by now having them read paragraphs (yes, paragraphs!) focusing on those particular word families. This passage, "A Big Cake," focuses on words that end with -ake. Because it's filled with words with a word family they've practiced, they'll be able to read this whole paragraph and hopefully fluently! This is a HUGE confidence booster. When students feel like they are good readers, they enjoy reading.. and enjoying reading is such a huge part of creating good readers! Plus this is great phonics practice. See how this passage is full of -ate words practice? This really increases their fluency to practice the sounds in word families like this! After reading each passage, they answer simple and direct comprehension questions (that they can actually read!) about the passage. It drives me crazy when passages use sight words kids don't know or hard to sound out words within an "easy" passage - it frustrates kids and then they don't get the practice they need and definitely not the confidence they deserve. I make sure every passage I use has words kids either know or can sound out. So important! If you want these, I have a ton of different packs of phonics based reading fluency and comprehension passages like this for all the different phonics sounds. These particular ones are from my Long Vowels Word Families Reading Comprehension passages pack but if you want them for the whole year, check out my big bundle of them: Reading Comprehension Passages ULTIMATE Bundle. Learning the phonics sounds is important but so is memorizing sight words. Sight words are words that appear often in text that can't be easily sounded out so students have to simply memorize them. The way they memorize them is simply repeated exposure and practice. I also recently posted Sight Words Bottle Cap Centers which I love! I use them for centers but then I also printed another set and laminated them for small groups. Students can simply look at the sight word, read the simple sentence for it, and then use a dry erase marker to write the sight word by copying a letter into each circle. It's really nice to have simple sentences for each sight word with a picture illustrating the sentence to help students learn the word and see it in context. Plus, I looove using bottle caps for centers! I also love using alphabet magnet letters with the sight words cards as well as using them in a pocket chart to introduce each new sight word. I show a lot of picture examples of this in my blog post Sight Words Sentences Cards Fun Ideas and Centers if you want to see those cards in action. If you’ve never seen how I use bottle caps for learning phonics, check out my Bottle Cap CVC Word Building Centers blog post where I show my CVC words bottle cap centers in action! Okay I think that is probably a lot already about reading! I have so many more activities I'd love to share with you but I still have so many other things to talk about! One of your most important routines is your morning routine. For a smooth morning each morning, decide on exactly how you want it to be - every little detail - and have it be exactly the same routine every morning. What do they do the moment they enter the classroom? Do they do a daily graphing question like I show in my Graphing post? Do they do something to show their attendance, choose what they’re having for lunch, etc.? Where do they put their backpacks? Where do they put anything from their backpacks to give to you (are they allowed to do that?)? Then what do they do? I think the 2 best options are morning tubs (play but educational centers they choose when they come inside in the morning) or morning work (a worksheet or other paper and pencil activity they do as soon as they enter). They take more time in the morning but I prefer morning tubs. Morning work can be any worksheet from packs you didn't otherwise use in class - there are a lot of worksheets to choose from in my phonics packs or math units so you can easily pull one from those to do in the morning. Simply have a place in your room that they go to grab a sheet for morning work once they've put their things down. That way you don't have to pass anything out and can focus on greeting them, taking attendance, etc. Don't waste your precious morning time putting it at their desks or table spots each morning yourself. They can easily get it themselves on the way to their seat if you simply have the stack of papers in the same place each day. If you'd rather do morning tubs, I plan on writing a post showing ideas for morning tubs but basically it's any centers you want to throw in tubs... or bins of math manipulatives they can play and build with... etc. It's basically centers but they get to choose what they want to do, sit wherever they want with whoever they want, and can talk in inside voices to their friends while they do them because you're not doing small groups at the time so it's okay if it's a little noisier than usual. :) Both are great options to start the day! Okay so you’re probably thinking of a million other things other than your bulletin boards but they also can’t be bare for open house, the first day of school, etc. so you may be overwhelmed in knowing what to put on them! Guess what? You don’t have to put anything on them! :) All you really need to make them look polished and ready is a background, border, and a title and they’re all done! I highly recommend picking a background color for each board that you can use all year and keeping it for all your boards all year. Black is a great background color because both student’s white papers and colorful crafts pop on it and it doesn’t conflict with really any color scheme you want to put on it. Light blue is also awesome. Yellow is also nice and bright. I don’t recommend white or red backgrounds, especially for your hallway bulletin board that you put seasonal writing and crafts on. This is an awesome tip – buy FADELESS paper to cover your board! It’s a little more expensive usually (mainly because you’re buying it yourself rather than the free butcher paper your school might provide in rolls) but invest in the fadeless paper so you can leave it up all year! Fabric is also awesome! You can find really cool fabrics online or have it cut the exact size you want at a craft store. The cool thing about fabric is it won’t have the lines where the paper overlaps AND it hardly shows thumbtack/staple marks so you can use it over and over which is nice for the all year use I was talking about. All you really need to do to start the year is put your backgrounds, borders, and title like I said. For your student work display board, you can put your class “Mrs. Kelly’s 1st Grade” or “Check out our work!” or whatever you want to indicate that’s where work will go. Put “Our Math” or whatever on your math board, etc. You don’t have to put anything on them – parents will look at it for 2 seconds and go, “Oh, cool, that’s where such and such will go.” If the school year hasn't started yet, it makes sense that there's nothing on them yet. Simply do the writing craft by printing them out and handing them to kids (they’re all on one page so you don’t have to prep anything! You literally just hit print and hand the papers to your students.) and hang them up each week, each 2 weeks, each month, whatever you want. It’s so quick to tack them up onto your bulletin board because they’re all the same size every time (perfect rectangles) so you can line them up once for perfect symmetry and use the same hole every time you change them out for the entire year so you’re never having to spend a bunch of time lining things up perfectly. Holy moly does this save A TON of time! I cannot handle if my bulletin boards are crooked in any way but I am horrible at trying to space/arrange things so this totally eliminates that dilemma, which is awesome! You can switch out a bulletin board in under 10 minutes. I personally use tacks to tack papers onto a bulletin board so I can simply put it right back in the same hole. If you’re not allowed to, you think kids might take the tacks, or you just feel more comfortable stapling, I recommend hanging them all up perfectly straight and aligned the first time, then using a pencil to make the faintest little line tracing each top corner. Then, every time you go to hang the new one, you can put the construction paper corners in those same places for a perfectly symmetrical board every time. Teacher tricks, woo! Oh, before I forget, I wrote this post on how to make your own bulletin board letters for free that I think you might find helpful! You can buy store bought ones too but it really is super easy to make your own to choose the exact font, size, and color you want! Writing is really fun in first grade but it can have its challenges. They’re just barely learning how to read but yet we expect them to write! You will be shocked how much their writing progresses in a single year. Definitely save beginning of the year samples from all of them for their portfolio & parent teacher conferences so you can be amazed at the growth. They’ll be doing a lot of writing with their phonics work, writing the words and sentences with them, which will really help them progress. Incorporate writing into the other subjects so they’re writing all the time. A page like that is really, really helpful for your students who struggle with writing. It will help build their confidence in sentence writing. You also want them to come up with their own sentences though. In first grade, it is really common to have a few students who are reluctant writers. It's usually a confidence thing. They may say they don't know what to write about but a lot of times it is that they just struggle with structure or are worried they are spelling words wrong. Kids like this can excel with a little bit of support. Sometimes they even end up being your best writers because it was perfectionism keeping them from writing. Let kids know rough drafts can be rough and the main goal is simply to get all of their ideas onto paper. Drawing a picture first then adding details to the picture also helps so much with writing. Writing pages like this are SO helpful for reluctant writers. First of all, there are pictures down the side which breaks up the page and makes it look a lot less daunting than a blank page of lines staring them in the face. Plus the pictures can really help inspire their stories! If they say they don't know what to write about, tell them to pick a picture and make it the main subject then try to fit them into a story using the other pictures. This is a fun challenge even for your highest kids! You could challenge your high kids to use as many of the words down the side as they can. Since the words are spelled for them, they don't run into the I-don't-know-how-to-spell-it cause for writing reluctance either. There are 2 kinds of these sheets as you can see above - the one on the right looks like a normal first grade writing page but has the words down the side and the one on the left has 3 individual boxes each with its own line. The 3 box version is awesome for your students who struggle with writing. Tell them for each box, pick a picture from the side and write a sentence for it. Super easy task that even your most reluctant writers can do. My Digraphs post and EW UE UI post both show examples of this type of phonics sheet completed so you can see what it'd look like. 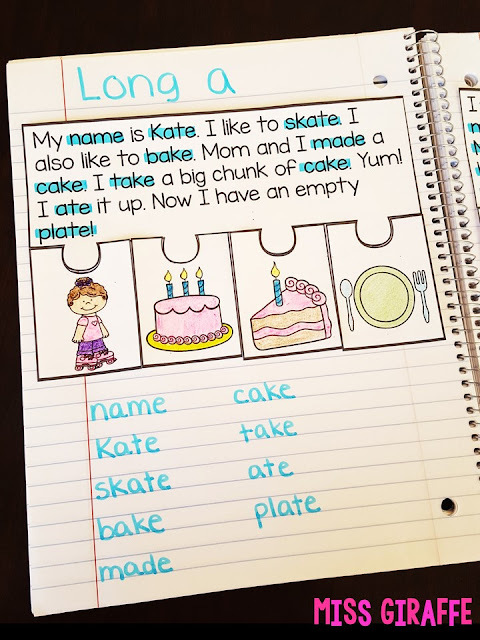 These writing sheets are from the same Long A No Prep Phonics Pack I've been showing you as an example during this post.. so I have these for all the different sounds so you can use them each week. For actual writing time, though, I am OBSESSED with No Prep Writing Crafts I talked about in the bulletin board section. You can use them for every type of writing, holiday, theme, etc. because you literally only have to hit print and kids write, color, cut, and glue to make a beautiful piece of writing so you can do as many as you want. They look amazing on bulletin boards and also are so easy to hang up to have new bulletin boards as much as you want to as I explained. Writing Crafts that are No Prep… Really! & that is just some of them! There are so many fun creative writing ones, opinion writing, how to writing, etc. There are 220 writing projects in the bundle currently so you could literally do a different one every single day if you wanted to :) I don't recommend that but what I'm saying is there are SO many to choose from! See how it's just one piece? Students simply write on the lines, color the picture, cut it out (easy because it's one big piece), and glue the whole thing onto a piece of construction paper. You could also skip the construction paper and just let them write and color the picture instead of making it into a craft. One thing I want to point out really quick is that the writing crafts are differentiated. Do you notice how the one above (girl version of "My Summer Vacation" craft) has 4 writing lines and is a single piece, but this crab writing has 5 writing lines and has more papers under it? I have a bunch of small packs of these writing crafts for different holidays, seasons, and types of writing but if you want ALL of my writing crafts from all of those monthly posts I linked and the ones I'm showing on this post and more, I have a HUGE BUNDLE of them here. It’s definitely what I recommend! Classroom management is so important in first grade! It’s nice if you can do a short behavior lesson each day for 5-15 minutes to go over desired and undesired behaviors. This is super easy to tie in to your read aloud because many books have a character lesson tied into them. This is a great list of classroom management books organized by behavior for you to choose from. Figure out what you want your classroom management system to be and have it set up to explain to the kids the first day of school. There are a lot of different methods! The first week of school will be a whirlwind! The first day goes by so fast in a blur and you are going to go home absolutely exhausted feeling each day of the first week. Have ALL your copies made and materials ready for the first 2 weeks before the first week of school because you will literally want to crawl in your pajamas and go to bed at 4:30 P.M. every day that week. That's not to say it's not fun! It's just so much all at once and you're ON 24/7 for the first time in a long time (or ever if this is your first year!) and you're running on adrenaline. The first week you're teaching them how to do eeeeeeverything - teaching them all of the different routines and procedures... literally teaching them how to sit in a chair sometimes... so like I said, you will be exhausted. But it's so exciting! You just met your class! Don't be stressed if you don't get to hardly any of the actual content teaching you planned to do that first week. Try to do it because you want to show them how your day is structured and how lessons are done, but SO much of your time will be teaching how to do everything that they most likely won't learn much content that first week and that's okay! The first week, teach everything whole group... like your reading centers. Let's say you have 5 different reading centers.. Perfect! Teach Center 1 day 1 whole group and play/do it all together whole group that first day. The second day, do Center 2 whole group and play/do it all together, explaining every step of how to play/do it, how to work with a partner, model in front of the class. Wednesday, do Center 3 whole group.. and so on! Then the following week, USE THE SAME CENTERS teaching the same skill but have them do it in their groups/partners how you plan on doing it during the year. Use the exact same one you guys did whole group so they can basically practice it. They're really learning how to do the centers at this point so that takes up a lot of their thinking which you would rather them use on learning a new phonics skill (combining both is a lot for them this early in the year! That's why I say consistency in types of activities is so important) and having them practice how to do the center will set you up for success all year. Plus they were probably just as overwhelmed as you the first week and didn't retain anything you guys did whole group since it was focused on how to do the center rather than learning the sound.. Short A, let's say. So if you're scheduled to teach Short A the first week... do Short A again the second week but they'll do centers as normal rather than whole group the 2nd week. If you're required to move on to the next sound the 2nd week (Short O, let's say), that's fine if you use something where the activity is consistent like I showed in my no prep packs, so they already know how to do it and can focus on the new sound.. but it's really nice if you can repeat the sound that 2nd week because they really probably didn't master it in the whirlwind of the first week. Do the same thing with your math centers. Teach them 1 a day whole group first then the second week they do them as centers. I hope that makes sense! For the first day of school, it's really nice if they have something to take home to show their family on the first day. It helps them tell their family about their first day and feel proud of their new grade and adventure. If they come home empty handed and their parents ask them how their first day went and what they learned, they might just shrug and say, "I don't know." If they have a cute little activity like this Back to School Writing Craft, tell them that when their family asks them, they can read it to them! Keep in mind these students were just kindergarteners. Their writing for this craft is not going to look like my example above yet. I don't recommend using the "extra pages" for this one like I did in the example. They're going to cut and glue down the 1 piece. Depending on what kindergarten is like at your school, they may not be super skilled with scissors yet so this craft may take a long time to complete. They will get much better and faster at these to the point where they are super quick to complete... but that time is not now so keep that in mind! :) Make sure you explain scissor safety and rules, how to use glue, etc. before doing the craft. Even if they did a lot of crafts in kindergarten, they've still been at home all summer which is plenty of time to forget the proper ways to use scissors and glue. They can definitely handle it though! You just need to set the behavior expectations before you give them scissors and glue. This is really the case for everything you give them the first day/week. Always say the rules for everything before it is in their hands. As far as the actual writing, some of them might not even know their letter sounds yet! Their writing is going to be very simple or it is going to be directly copied from yours. That is totally normal for this part of the year. We went to music class. We read a book about the first day of school. I met my new teacher. We practiced how to do centers. or whatever they say. Write them in easy sentences on the board nice and big so they'll be able to see them from their seats. This is a great way to review the day anyway! I was scared but I had fun. I had a fun day! THEN send them back to their seats to work on their writing. Some kids will write their own stories. Tell them not to worry about spelling and sound it out.. but if they ask you how to spell a word, tell them. They're most likely used to asking adults how to spell things and being told. You'll break them of this habit later but for now, spell it for them if they ask. You can also write it on the board in case other people have the same question. This may start a How-do-I-spell-?? question asking frenzy but that's okay, it's the first day and you just want to help them be comfortable. Other kids will copy one or two of your sentences verbatim onto their writing and that's perfectly fine. (You don't tell them this but) that's why you left it up on the board. Let them take this craft home to their families, even if they don't turn out the cutest. For your Back to School bulletin board, I recommend doing an All About Me activity! Kids LOVE to tell you all about themselves all year but, especially right now, they want you to know them! & I'm sure you want to know about them too! My name is ____. I am __ years old. I like to ______. Do an example using your info on the board for them to use as a template. You could also do this craft on the first day of school instead! It makes a great bulletin board. Let them pick whatever background color of construction paper that they want and you'll get an awesomely colorful back to school bulletin board because of all the different background choices! Make one of you too alongside them to hang up on the bulletin board! It'll really help them feel connected to you! You can read them yours as well so they see yours as an example of what it should look like. Setting up your first classroom can be streeeessful. It's not just about making it cute, you have to figure out how to make it functional. Thinking about it now, why are there no guides to this?? I would love to have a side career setting up classrooms for new teachers. When you've never run centers before, it's hard to know how you want your tables to be organized to facilitate them. If you haven't set up your classroom yet, you're probably going to walk into an empty room with a bunch of furniture shoved against the walls.. or maybe no furniture in there at all (you'll get it from a supply room or other area of the school yourself.. or possibly ask the custodian for help. Your school custodians are the heroes of your school by the way - they do so much for you and are usually so kind and helpful). - Small groups table: I recommend putting this on the opposite side of the room as your teacher desk. Have at least 6 kids chairs at it. - Community supplies: Many, many people use caddies in the center of their table groups' table to hold pencils, crayons, etc. They will eventually have scissors and glue in them but DON'T put scissors and glue in them the first day! Or even first week. Not until you trust them with them and they know the rules. For now, put a table group set of scissors and glue sticks in a pencil box for each table. The table leader (or whoever you call on from each table) can get it for their table when you say to. Up to you if you want to put markers in there. I think most people only put crayons and pencils. Kids notoriously leave the caps off markers so they're kind of treated as a special treat, luxury classroom item to get to use markers. I recommend keeping them in your teacher supplies and pulling them out each time you use them (until you know you can trust them with them). - Whole group teaching area: This is where your big carpet will be. I recommend putting your carpet right in front of your big white board then have a chair to the side of the carpet (on one of the small sides of the carpet) with your easel next to the chair if you have an easel. Magnetic white board easels are SO nice. If you don't have one, ask your principal if there is one in the school you can have. I actually bought my own but they can be really expensive so definitely ask first! - Pocket chart center: If you're going to have a pocket chart center, that won't be at their tables so figure out where you want that to be. Some people have a pocket chart stand their pocket chart hangs on, other people hang it on a wall. - Place to keep your favorite read alouds: If you do have ONE labeled bin of books, have it be your read aloud bin. This is where you keep books you plan on reading out loud to the class. Kids need special permission to go into this bin or aren't allowed in it at all. If you have one of those book display shelves, those are perfect for displaying your read alouds for the whole month. It's fun to switch them out each month so kids see which new books you're going to be reading! Just tell kids if they take a book from there, they have to put it back on the display shelf and not back in the bins of books. After each month, put the books from that shelf in your "October" read aloud bin so that you can quickly pull them out again the next year. You can do this however you want though! Maybe you don't even plan out your read alouds and just grab books from your bins. That's cool too :) Some people use their read aloud time to start lessons, others just use it as a fun time to read to and connect with their kids. Your teaching style is up to you! - Place to store all your math materials, reading materials, science materials, etc. when you're not using them - hopefully you have cabinets you can shove your bins into. If not, buying bins that can stack and putting them in box shelves looks really organized too. Put all your place value blocks in a bin, all your coin manipulatives in a bin, all your cubes in a bin, etc. so you can easily pull them out when you need them. - Place where you keep all your masters of activities: Some people use binders, some people use a filing cabinet, some people use both. I use both but I think files are easier. It's really easy to misplace binders, have papers fall out, etc. whereas you're not going to carry around your filing cabinet and leave it in the copy room :) Definitely have a labeled place to put all your masters back into though, it'll save you so much time next year. If you're using a filing cabinet, make a file for each phonics sound you teach, each math concept, each holiday, etc. Also make a file for each student to put their work samples into. Even if you have nothing to put in them now, it'll be nice to have them already made so you can drop your masters into them as you find cute, fun stuff to use that you want to use again. If you don't already have these things in your room, see if your school has a supply room or ask your school's instructional coaches if they have any before you go and buy anything yourself. Here is a list of some great Back to School books you can read to your students the first week of school. I’m writing this post with first grade teachers in mind but I think this post could be helpful for K-2 teachers as well so if you are a Kindergarten teacher reading this, I really love the books on this list of back to school books specifically for kindergarten. & of course I love this list of Classroom Management books I mentioned earlier. There’s sooo much to teach in first grade, you’re going to wonder how you fit it all in and it’s so hard to come up with a schedule at first but you’ll work it out. Know that “OMG I have 185 days to teach 3,528,265 things… before I even try to squeeze in science” is super normal so let that stress just roll off your back. If you’re not given a sequence/timeline of when to teach what, break your school year into each week. Make sure you mark breaks, short weeks, holidays, etc. so you don't accidentally start a huge unit right before a break. In each week, put in the phonics skill you’re introducing that week for each week. Then put in your math. Etc. The best way to fit in a ton of learning is to integrate a lot between the subjects. For example, if you have a really small amount of time in your schedule to teach science, extend the amount of time you get to learn about science by incorporating it into your other subjects. Let's say you want to teach about space in science but you only get 30 minutes a week in your schedule for science. During your read aloud time, read books about space and the moon and planets that week. There are so many awesome space books.. and you can throw in the funny alien books too! They're super engaging! During your writing time, focus on nonfiction writing and have kids write about the moon! Or if you wanted to practice creative writing, have them imagine they went to the moon and write about it! You could also tie it into your reading time by teaching students how to "research" and have books in a bin all about the different planets (ask your librarian - she probably has a lot of space books you can borrow! If not, your local library probably does... or you can go online to get them - space books are great to have in your library anyway - kids eat up nonfiction science books with great pictures all year). Then, have them each pick a planet they want to become an expert on to read books about. I include a craft for each planet in my Space Writing Crafts pack (which are also all included in the big bundle of course) so each kid can pick a planet to learn about. Then, during your writing time, they can make a writing craft about it. See how much you just extended science and fit it in by integrating it into your other subjects?? You can do that with so many things! Then you could even have them get into little groups of 4-6 kids who have different planets than them and present their planet as an expert which is great for building listening and speaking skills. After they're all done, you can quickly hang all those different planets' crafts on your hallway bulletin board with a cute title like, "We're space experts!" and BOOM! You have a brand new, adorable bulletin board that shows how much you're learning! Other teachers will probably walk by and think, "Wow. I can't believe she (or he) can fit in science... AND crafts on top of it. I wish I could do that!" That's one thing about perception I want to talk about really quick. As a new teacher, you're probably going to look at other teachers and feel inadequate all. the. time. Don't do that, you're not! It's easy to have those same feelings of inadequacy even after 10 years of teaching because you don't see other teachers' struggles and piles of papers hidden under their desk and nights spent working at home or hear their thoughts, you just see their highlights of cute bulletin boards and pretty, organized looking classrooms but you see everything of your own, good and bad, so it's easy to judge yourself harshly against others when you see your good and bad and only their good. Please don't. :) You are AWESOME. If you've actually read this far down into this enormous blog post, I can assure you that you are a dedicated, amazing teacher already. Even if you are simply skimming it for ideas and came across this section, you're here and you're looking to see how you can be the best teacher you can be, and honestly that tells me you're already pretty fantastic. So much of teaching is simply caring and you being here, reading this, shows you exemplifying that wonderfully. Feeling overwhelmed or inadequate or thinking thoughts like, "Oh my gosh how am I going to get all this done?" are actually signs that you are a great teacher, a teacher who cares and is looking for the very best for their students. Anyway! Back to integrating.. You could also even do your space unit during your Soft C phonics week since SPACE is a perfect example of a Soft C word where the E at the end of the word makes the A say AY and the C say SSSS. You could read the Soft C reading passage out of my Soft C and G Reading Passages pack "Grace in Space" during reading groups or centers. That pack is included in the big reading passages bundle I talked about in the reading section. If you have a designated snack time as a class (some schools do, some schools don't) and you're learning about the moon, you can get crackers with cream filling inside to pass out and have each table make a different phase of the moon by taking off the top cracker and eating some of the creme off the bottom half to make it look like the moon phase. There are just so many ways you can integrate! First grade is really fun that way! There is so much to learn in first grade so it is awesome if you have parent support for when you need their help at home (mastering sight words, homework, helping specific concepts a child is struggling with, reading at home, etc.). Try to involve parents when you can and make sure they always know you’re a team and working together. Say 4 or 5 positive things for every negative. Make sure the very first interaction you have with them is all positive. Since they’re still so young, homework falls a lot on the parent so, if you are going to send home homework, make sure you communicate the homework expectations to them somehow (let them know you send home a weekly packet or to check their kids' homework folder each day or however you do it) and try to keep it consistent each week to make it easy for parents with busy schedules. I know you can barely squeeze in science and social studies but find a way to have completely unstructured play in your room for even 10-15 minutes at a time at least once or twice a week. If you do morning tubs then perfect, you’re already doing that! If you do a morning talk or morning work instead, then try to fit in some play time (yes, play time!) in your room now and then. It helps them see their classroom as a fun place. They learn valuable social skills and they’ll even pick learning activities that reinforce what you’re learning in class a lot of the times anyway. You’ll be shocked they pick math centers to do or read books or play teacher with the pocket chart. They need breaks! I recommend having them work for breaks where it seems really random. Don’t say, “Let’s work and we’ll have a break at 2:15.” Instead, when they’re working really hard and quietly you can say, “Wow, if we keep working so hard and quietly like this for another 5 minutes, we might take a break!” so it’s something they earned, not something scheduled or promised. If they’re being chatty and not working, you could say something like, “I was really hoping to take a break soon. I’d love to. If you guys can work really hard and quietly for the next 15 minutes… we might take a break.” as a redirect as well. Sometimes you can just randomly say, “Wow, you guys are so amazing! We’re going to take a break. You can jump up in 3.. 2.. 1… Go!” and let them have a quick 5 minute break. Establish boundaries for break. They can get out of their seats and talk to friends or dance around the room but can’t do cartwheels or crawl on the floor or whatever your boundaries are. I would say they can’t get anything out or play with anything in particular because a break is only 5 minutes or so. Up to 10 minutes if they (or you) really need one. It's basically just a mental break and to get out of their seats, talk to their friends, etc. Sometimes you can do a break because YOU need a break. One of your boundaries can be that it’s a break for you too so they can’t talk to you for that 5 minutes. This gives you a second to decompress or get something done really quick as well. If you decide to “break” with them and go hang out with them, that’s totally cool but only if you choose to. I covered this a lot in the reading and math sections but I just want to reiterate how important it is to differentiate. You want every kid in your class to feel like they are learning, challenged (but not extremely challenged), and definitely not bored from not being challenged enough. If you haven’t ready my How to Keep Gifted Kids Engaged and Learning post, that’s a helpful read for making sure you’re challenging your high kids. It’s easy to think of accommodations for your struggling students and forget about the higher performing students because they feel like a check on a checklist of “They got it!” when you’re teaching something but they still want to learn too so that’s a great post if you have a second to read it. First grade requires a TON of differentiation. Once you get in the hang of it, though, you’ll differentiate naturally. Finding materials is typically the hardest part. That’s why I’ve spent the last few years making a ridiculous amount of math and phonics resources haha. Can you just gather everything I need for me? I had a lot of requests to bundle all of my big bundles. I was apprehensive making a bundle this huge BUT I got so many requests from people who loved my math units and phonics packs but wanted them all and begged me to make an even bigger bundle… a GIANT bundle of my already GIANT bundles… and discount it even further… so I did! This has ALL my first grade math units, ALL my first grade phonics no prep packs, ALL my phonics fluency notebook materials, ALL my no prep writing crafts, ALL the Reading Fluency and Comprehension passages I showed you, and more! I am so excited about it because if you are new to first grade, oh my goodness, you just found ALL your math and phonics gathered and planned for you! 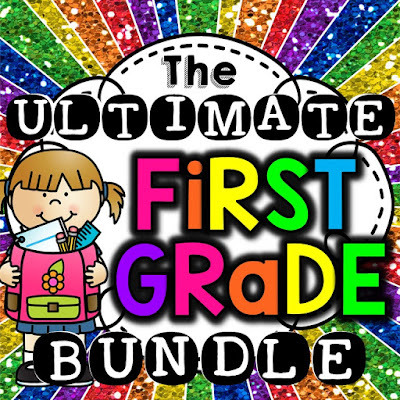 If you are new to first grade and/or simply want EVERYTHING (and I mean everything) made & planned for you for the entire year, then you want this bundle. It may seem like a big investment but that's exactly what it is... an investment! The time and energy and stress it will save you throughout the entire year is gold. I don’t want to push it on you at all but it has all of my favorite HUGE bundles bundled to save even more! It has all 18 of my first grade math units. All of them! So you’ll have differentiated math worksheets in 3 levels for every math concept for the entire year, math centers for the entire year to match those concepts, and math assessments for the entire year to match those concepts. I can’t even imagine what it’d be like to have all that already done as a first year teacher or a teacher coming into a new grade. It also includes BOTH of my Phonics No Prep Packs Bundles so you have No Prep packs like the Long A one I showed for all the first grade phonics sounds I’ve made! This means you’ll have differentiated phonics worksheets for classwork, homework, and literacy centers for the entire year. 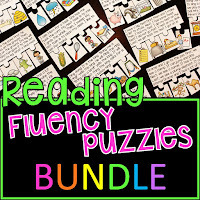 It also includes the bundle of my phonics based reading fluency and comprehension passages like the ones I showed above so you have fun reading fluency and comprehension passages for the entire year that kids enjoy and can actually read. It also includes all the materials for my phonics notebooks I showed you the Long A example for! 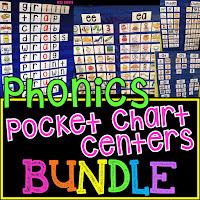 Also my huge bundle of phonics pocket chart centers I didn't talk about in this post so you have those for the entire year as well… You can see some of the sorts and what they're like in my How to Organize Pocket Chart Centers post. I also show a lot of the ways I use the picture word cards in my Short A post if you didn't look at that one already. All of those pocket chart sorts are in this bundle too! AND ALL OF MY NO PREP WRITING CRAFTS! Yes, all of them!! Don’t feel pressured to get anything you don’t think you need but I think it’d be a disservice to you as a new first grade teacher for me not to tell you about it because I so highly recommend it and it’s such a huge discount. To not have to spend time gathering every week… finding centers… hoping they actually match what you’re teaching and what’s on your worksheets… differentiating your worksheets… finding homework to match… searching for crafts all the time and having to prep them (mine are no prep)… this just helps you not have to deal with any of that nonsense taking up your nights and weekends and get back to focusing on doing what you love most… TEACHING! I hope this post has been helpful for you!! If you feel absolutely ridiculously overwhelmed right now, that is NORMAL. I went over a lot! If you feel as though there are any parts I left out or if you have questions about any part of it, please leave a comment and let me know! I’m happy to help! You are going to love first grade!! If you enjoyed this, I have a LOT more posts I plan on posting soon to explain more things! I often announce on FB and IG when I post new blog posts so that's a great way to follow along! Here's an image you can pin if you want to save this post to read later! I have so many more fun blog posts I plan on publishing soon to share with you! Please fill out THIS QUICK FORM to join Miss Giraffe's Class to receive fun emails from me! Don't forget to mark the checkbox! Check out all the phonics sounds available HERE!